There are two main types of reporting on the posBoss Management Site. Sales reporting - Located under the Financials tab, this report takes into account all of the variables that affect the amount paid for an item, such as discount, wastage, hospo, account assignments and payments. This report displays a list and totals of all items and modifications moved through posBoss in the reporting time period selected. It defaults to the current day but any time period can be reported on. You can export this report out to a .csv file. Note: Anything showing in green will appear on the report. In the pic below we are displaying alcoholic and non-alcoholic beverages. 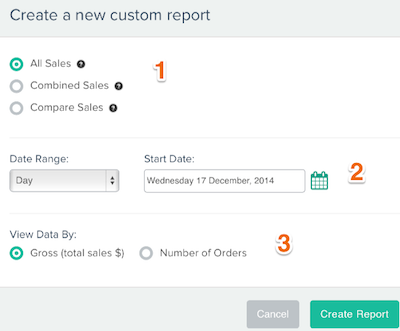 The items analysis report allows you to build, view and export custom reports, based on gross sales. You can view all sales as well as compare or combine items, modfications or tags. 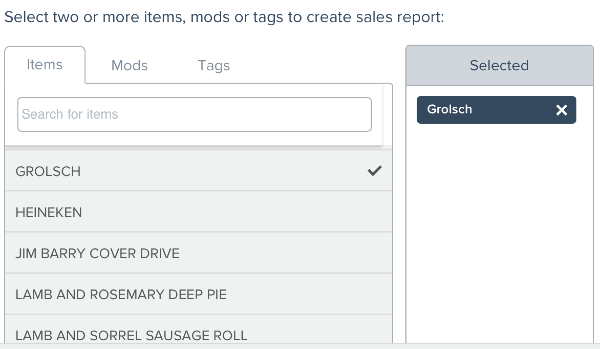 To access the analytics for your menu items, go to the Stock tab and click the Items Analysis report. The custom report screen will appear. There are three selections common to all reports. For the compare and combine reports you can select to report on items, mods or tags. Simply click from the left hand panel to add to the selection screen on the right.